We are now entering the third week of our pensions’ dispute. Already we can see the impact the strikes are having on Higher Education. 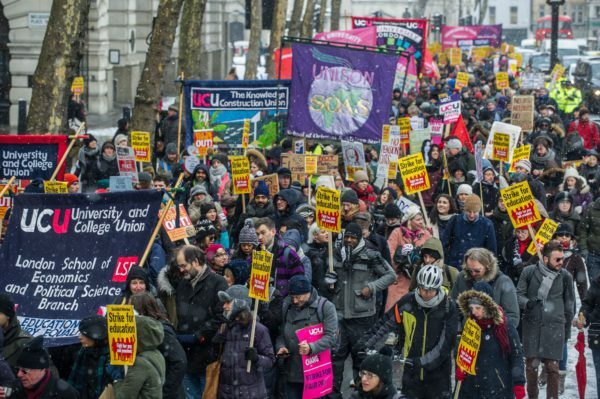 University workers have demonstrated a commitment to the action in numbers far greater than UCU has seen before. We have sparked protests amongst students who, in supporting us, are organising their own occupations and protests against marketization of education. Many of those on strike are for the first time, including young low paid and casualised workers often without hope of pensions. They know inequality needs addressing and that we need to win this strike to have the leverage to address these issues. And the employers have lost the intellectual argument over pensions, the deficit and the necessity of cuts. Even a press which is anti-strike is making the connections between the hypocrisy of Vice Chancellors feathering their own nests while students and staff suffer cuts. The employers are splitting into different camps. We now need to turn our attention to winning this dispute. The strikes have already forced employers to join talks starting this week. In the talks that took place last week the employers didn’t even attempt to talk about their individual Defined Contribution scheme. That doesn’t yet mean DC is in the bin but it does mean UUK are having to finally hear that members won’t accept anything less than a defined benefit scheme. Out action must stay on throughout any talks. We cannot rest until we have nailed down a settlement that members can support. We all know that commitments made to end the action are commitments that can be given up once the action stops. Therefore we must not end our action until we have a firm agreement to defend our pension scheme. But what kind of “Defined Benefit” is achievable? As part of the negotiations, UCU has made an offer to the employers that accepts cuts. It comes with a small reduction in accrual rates from 75ths to 80ths to UUK. When we started this campaign this demand would have looked like victory. And it is a long way from the Defined Contribution 40% cut the employers were demanding. So to achieve this would be a significant victory for the union and its members. It will prove that action can win. But we can go much further. Central to the dispute is the question of the “deficit”. There are now few Senior Management Team members in Higher Education who can defend UUK’s position. There is no deficit. It only arises as a potential outcome if the scheme is closed and ‘de-risked’. This is irrational. The only circumstances which could generate such a deficit would be the meltdown of Higher Education in the UK. Unless the Vice Chancellors and the Government are lying to the students, staff and the general public, Universities are not about to go bankrupt. It is not just that USS is a multi-employer scheme – it is a multi-employer scheme whose members are all 90% bankrolled by the Government through the taxpayer, from tuition fee loans to research and platform grants. It is now a realistic and indeed sensible demand to call on UUK to agree with UCU that there is no deficit. Why should any member pay more to get less on the basis of a “deficit” that has been so thoroughly debunked? We must turn our attention to the Pension Regulator’s role in creating this deficit crisis. 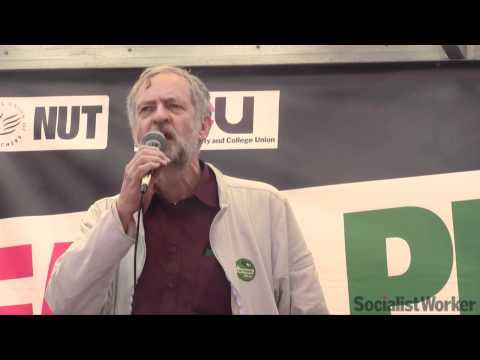 When the Government bailed out the banks, it devalued its own credit. So-called “Quantitative Easing” has created a high cost and low returns on government bonds (‘gilts’). The Pension Regulator puts pressure on Trustees of pensions like USS to value their scheme as if their assets were replaced with these gilts. And then inflation eats the value of the pension pot, generating a potential deficit. This is nonsense on stilts. It is like valuing a car in terms of its scrap metal. If USS were valued in terms of its actual assets it would be in surplus by any meaningful measure. There is no crisis. We should demand that the Government step in to protect USS, indemnify the Trustee Board from the bogey of sectoral bankruptcy, and tell the Pension Regulator that USS must not be treated like a single employer scheme like the Carillion or BHS pension fund. If the Government, through its Pension Regulator, believes a pre-92 university is at risk of bankruptcy over the next three years it should release this information immediately! Stop miss-selling to prospective students, who will find themselves unable to graduate from the University of their choice. This would immediately release both UUK and the USS Trustee Board to reach an agreement with us to protect our pensions. While a cut from accruing 80ths and 75ths may not appear a great amount, if one does the arithmetic there would be a considerable loss over a lifetime. To take some rough averages, final salary of £40,000 after 20 years of employment would give a pension of £10,666 per year using 75th and only £10,000 at 80th. Should you live 10 years after retirement, you would be £6000 out of pocket.